Welcome to the conclusion of a two part introduction to Project5. In the first article we covered rudiments such as signal flow and patterns. This time around we'll explore a few advanced concepts that build on the first discussion. The Pattern Bin provides a dedicated resource for browsing and auditioning Project5 patterns. A pattern is a sequence of MIDI events and automation, which you can drag directly into your arrangement to be played on any synth track. Therefore a pattern's true identity surfaces when you it plays through just the right synth and effects chain. In Syn.Ops (Synth Operations), click Velocity's Load button and select "Trance Kit 01"
In the Pattern Bin, scroll down to the patterns starting with "Trance Kit…" and double-click on "Trance Kit 01_a". The pattern's events are now displayed in P-SEQ. Velocity should be trancing out right now. Now try previewing the other Trance patterns, moving down list in succession. When you find the pattern you like, click P-SEQ's Send To Track control. The pattern is now part of the song and can be arranged as you see fit. In Syn.Ops, right-click on PSYN's patch bank "B" and select the patch "Perky Bell"
In the Pattern Bin, scroll to the top of the pattern list and double-click on the pattern named "303 01_a"
As you did with Velocity, begin auditioning other patterns in the 303 section, and then try other pattern sections. You can also try changing PSYN patches while the pattern plays. Auditioning material has never been so much fun! 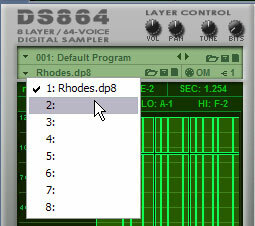 Project5's synthesizers are an integral part of the package, so here are a few tips you should be familiar with. The DS864 (AKAI S1000/S3000, SF2, Kurzweil K2000, WAV, AIF) provides 8 independent voices and 8 assignable stereo outputs, which makes for some serious mixing and layering potential. 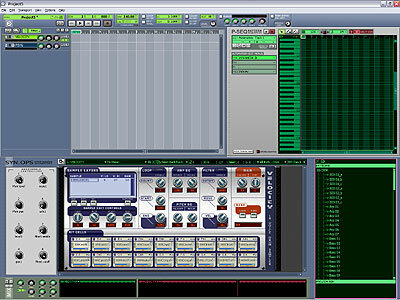 It's all managed by the control cluster in the sampler's top-left area. You now have a two-voice patch. You can specify unique MIDI channels and audio outputs for each or use the same. 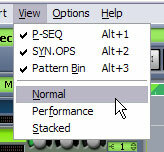 Also note that all of the sampler's parameter settings (filters, envelopes, LFOs, etc) are unique to each layer, providing serious sound sculpting muscle. 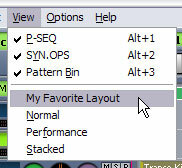 When you have the program dialed in to your taste, save it as such using the Save control above in the top-most Program Control section. In the plug-in's preset menu, select "Piano Room, Med"
Now you have the ultimate utilitarian piano, sure to sound great in any mix. Go tickle them ivories! Want your drums to sound like they were freaked out by your favorite remix artist? Here's a quick guide to get those electronic flams happening in Velocity. In Velocity, load the kit "Layered Acoustic"
Tip: In order to achieve this fine setting, hold down the [SHIFT] key while you drag on the control with the mouse. This gesture provides a "fine-tune" control for all of Velocity's parameters. Now trigger that pad again and start remixin'! Here's an undocumented trick relating to P5 Layouts (*.p5l). Layout files are just a way to recall window dimensions to assist in workflow. Out of the box, P5 gives you three: Normal, Performance and Stacked. Type a name for your layout, being sure to manually modify the file extension so that it reads ".p5l". Example: "My First Layout.p5l"
The next time you launch P5, your new layout will be ready to greet you in the in the View menu (Fig. 10).